You’re taking yet another picture of your adorable baby. They’re smiling and looking right at you—perfectly posed for the picture—and then you notice it. Their teeth have white spots on them. Your precious baby has the beginnings of baby bottle tooth decay. 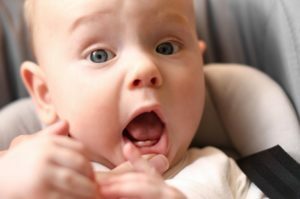 Before you panic, here’s some helpful information about it, so you can make sure your baby’s smile stays as cute as can be. The bacteria that cause tooth decay thrive on sugar. They then create acid that attacks teeth. When this happens in children under 5, it is commonly called baby bottle tooth decay. Even if your baby doesn’t eat solid food yet, think of the sugary fluids your baby consumes: milk, formula, and/or juice. All these can contribute to this dangerous condition. If your child shows these symptoms, see your pediatric dentist immediately to prevent the decay from spreading. Why does baby bottle tooth decay happen? Many infants sleep better on a full stomach or fall asleep easier while drinking milk or formula, so parents often use feedings to help their infants drift off to dreamland. But that’s the time when your baby’s teeth need the most protection. We tend to produce less saliva while we sleep, so all the sugars in your baby’s mouth linger, cling to your baby’s teeth, and start to feed harmful bacteria in your baby’s mouth. If left there, it can lead to tooth decay. Why does baby bottle tooth decay matter? Baby teeth are temporary anyway, right? It doesn’t matter if they end up with a few spots of decay, right? Wrong. Children typically lose their baby teeth between the ages of 6 and 12. Your baby will need their teeth to chew, talk, and smile for a long time before their permanent teeth come in. If your child’s teeth become infected or even removed too early on, they might experience trouble eating or speaking correctly. In addition, their adult teeth could come in crooked or damaged. How can I prevent baby bottle tooth decay from happening to my baby? Here are some basic tips to stop baby bottle tooth decay before it begins. Oral hygiene for your baby should commence basically from birth. Gently massage your baby’s gums with a washcloth, and start brushing twice a day when you see that first tooth cut through. By their first birthday, begin bringing your baby to the dentist for checkups twice a year. Your dentist in Bergenfield can help monitor their growth and dental development and catch any issues early. If possible, avoid giving your baby a sugary drink right before bedtime, even if they don’t take the bottle with them. If you want or need to give your baby a bottle to go to bed, give them water. That way, you’re actually helping their teeth stay cleaner. To start with, over time you can dilute the bottle with water, so your child can acclimate easier to the change. Make some changes in your baby’s diet. If your baby has started eating solid food, you could limit their consumption of acidic foods, like grains, dairy products, processed foods, and meat. Also consider reducing the frequency and amount of juice you give them. Don’t dip your baby’s pacifier in honey, sugar, or syrup. You would do anything to protect your child, and that includes attending ongoing dental care with a trusted pediatric dentist. By following these tips, you can keep your baby’s smile happy and healthy for years to come. Smile More Kidz has four talented and compassionate pediatric dentists. They all have years of experience and expertise, but they also make dental visits fun and stress-free for their patients. These pediatric dentists can offer effective, specialized care, even in advanced cases. Contact Smile More Kidz and these dentists by calling (845) 859-6060 or clicking here.